"Here you will learn how we must contextualize, how we Christians should be as active in Hollywood, Wall Street, Greenwich Village, and Harvard Square (if not more) than the halls of Washington, DC. And yet, there are ringing calls to form a distinct, 'thick' Christian counter-culture as perhaps the ultimate witness to the presence of the future, the coming of the Kingdom." 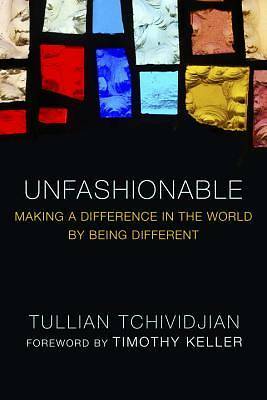 "Tullian Tchividjian, one of today's brightest young Christian leaders, makes a refreshing call for orthodoxy. He does not apologize for the gospel; he wears it like a red badge of courage. Read this book to recover the faith once for all delivered to the saints in fresh, courageous terms." -Chuck Colson, founder of Prison Fellowship and author of "The Faith"
"Tullian Tchividjian is the real deal. His life and his words speak in stereo. I love reading books that challenge the way I think. "Unfashionable" goes beyond that. It's counterintuitive. It's counter-cultural. And it's a must-read for those brave enough to really follow in the footsteps of Jesus." -Mark Batterson, lead pastor of National Community Church in Washington D.C. and author of "Wild Goose Chase"
"With the right balance of reproof and encouragement, critique and construction, "Unfashionable" displays with succinct, vivid, and engaging clarity the relevance of the gospel over the trivialities that dominate our lives and our churches right now.."
""Plainly, powerfully, and pastorally, "Unfashionable" gives a bird's-eye view of the real Christian life-Christ-centered, church-committed, kingdom-contoured, future-focused, and counter-cultural all the way. It makes for a truly nutritious read." ""In this windowless world, God, transcendence, and mystery have become less and less imaginable.... Everything's produced, managed, and solved 'this side of the ceiling, ' which explains why so many people are restless and yearning, as I was, for meaning that transcends this world-for something and Someone "different.""